Strand displacement and tile assembly systems are designed to follow prescribed kinetic rules (i.e., exhibit a specific time-evolution). However, the expected behavior in the limit of infinite time—known as thermodynamic equilibrium—is often incompatible with the desired computation. Basic physical chemistry implicates this inconsistency as a source of unavoidable error. Can the thermodynamic equilibrium be made consistent with the desired computational pathway? 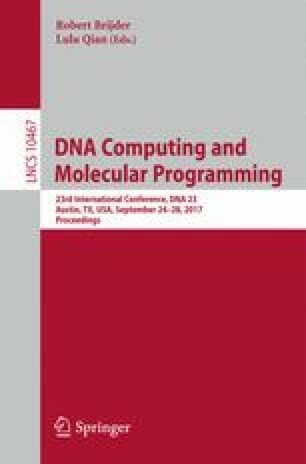 In order to formally study this question, we introduce a new model of molecular computing in which computation is driven by the thermodynamic driving forces of enthalpy and entropy. To ensure greatest generality we do not assume that there are any constraints imposed by geometry and treat monomers as unstructured collections of binding sites. In this model we design Boolean AND/OR formulas, as well as a self-assembling binary counter, where the thermodynamically favored states are exactly the desired final output configurations. Though inspired by DNA nanotechnology, the model is sufficiently general to apply to a wide variety of chemical systems. D. Doty—Supported by NSF grant CCF-1619343. T.A. Rogers—Supported by the NSF Graduate Research Fellowship Program under Grant No. DGE-1450079, NSF Grant CAREER-1553166, and NSF Grant CCF-1422152. D. Soloveichik—Supported by NSF grants CCF-1618895 and CCF-1652824. C. Thachuk—Supported by NSF grant CCF-1317694. D. Woods—Part of this work was carried out at California Institute of Technology. Supported by Inria (France) as well as National Science Foundation (USA) grants CCF-1219274, CCF-1162589, CCF-1317694.